We're delighted to name Dave Cornthwaite, world-wide adventurer, record-breaker and campaigner, as the Aquapac Outdoor Champion 2012. With the title comes a cash award £1,000 in recognition of Dave's achievements and future endeavours. We caught up with Dave for this interview when - unusually - he was at home. Aquapac: So it seems we're lucky to find you here. You've just come back from an expedition, and you'll soon be heading off again. Tell us where you've been. 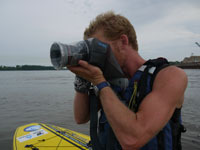 Dave: I've been descending the Mississippi River this summer on a Stand Up Paddleboard, a total of 2404 miles in 82 days. Aquapac: That sounds a long way! We'll come back to the journey in a moment. But first, what is stand up paddling? Dave: Simply, it's a long surfboard designed with stability in mind so the rider can stand up, and use a long paddle for propulsion. It's like punting, but for cool people! 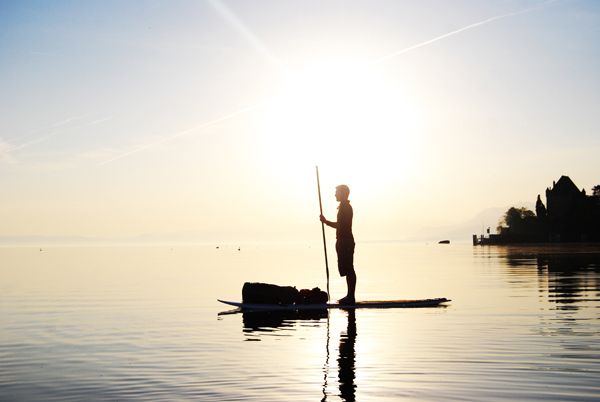 Stand Up Paddling, or SUP, is the world's fastest growing watersport, but only recently has it moved inland from a traditional surfing background. It's great for core strength, the view is superb, and it's a beautifully simple way to travel. Aquapac: Cool indeed. Now, this Mississippi journey was part of a bigger project called Expedition1000. Can you tell us a little more about that? Dave: I've done expeditions before, but they were one-off events, so I've started to think about my career as a long-term project. Expedition1000 is a project combining twenty-five journeys, each one at least 1,000 miles in distance and each one using a different form of non-motorised transport. Expedition1000 has simply energised me; it's given me a chance to develop an array of new skills, see different parts of the planet and challenge myself physically and psychologically - all the while moving almost seamlessly from expedition to expedition. Aquapac: How did you get into travel and outdoor adventure? And why not just have a go - what inspires you to take them to the limit and break world records? Dave: Once upon a time I was an unfit and utterly miserable graphic designer desperate for a change in direction. The catalyst was a long skateboard, which I pushed the length of Britain and then across Australia in 2006. After that I decided to try and make a living by undertaking challenges that would both break down my innate fears and give me a chance to travel. World records are there for all of us to have a go at. I've never been an outstanding athlete, the only reason I've managed to break a few records is because I said "yes, I'll go for it". Aquapac: And go for it you did. As part of Expedition1000, you've already travelled by kayak, skateboard, stand up paddle and tandem bike. What's next? Dave: I've got a number of expeditions in the planning phase. Horseback, rowing boat, paraglider, pedal bike, recumbent bike with a sail, a cross-trainer on wheels, pedal, hydrospeed... It's such an exciting time with so many possibilities. Aquapac: How are your plans going? Dave: Everything is going well. The hardest bit of Expedition1000 is to keep focused in between expeditions; writing books, going on speaking tours, actually making a living from the stories my journeys generate. Aquapac: As well as (or along with) these impressive feats of physical endurance, you're also an active supporter of some specific charities including the AV Foundation and CoppaFeel. What are these, and what do they do? Dave: My aim throughout Expedition1000 is to raise £1m for charity. I've worked with the AV Foundation for years, ever since I spent a year in Uganda with them when I was 19. They develop infrastructure and drinking water systems in East African schools. CoppaFeel is an innovative breast cancer awareness charity, set up by my friend Kris who was diagnosed with breast cancer at the age of 23, having been misdiagnosed twice in the preceding year. The CoppaFeel message is to know your body and ensure that any abnormalities are treated as early as possible. Aquapac: As well as these charities, you're also an ambassador for the Blue Project - what is this? Dave: Blue is a climate and oceans initiative that inspires people to develop an awareness of the environment through sport and travel. I don't believe we can really make a positive difference to anything unless we truly care about it, so on my journeys I encourage people to join me and by doing so they then have a direct investment in the areas where they play and travel. Aquapac: It certainly sounds like you're busy. As well as Australia, Canada, the USA, where else have you travelled, and do you have a favourite part of the world? Aquapac: Are there any other places you'd like to go? Dave: I can't wait to cross an ocean by myself, I can't think of a greater psychological challenge than having thousands of miles to cover without anything tangible to aim for or judge my pace by. Aquapac: Talk of oceans brings us neatly to water protection. Tell us about the Aquapac products you use. How did they perform on your recent journeys? Dave: I share all of my expeditions online, so I carry with me a GPS, Spot Tracker, Smartphone, MacBook and hi-definition cameras. 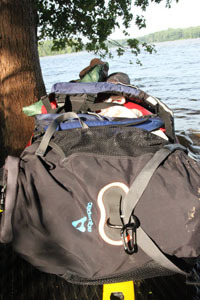 I can't afford to be without any of these items and they were protected through my Mississippi River journey by Aquapac products. The smaller items lived in Whanganui and Stormproof cases, my DSLR camera in the Stormproof SLR Camera Pouch, while my MacBook, batteries and wires stayed safe inside a Wet and Dry Backpack. I was on the move for almost three months, exposed to extreme heats, punishing electrical storms and heavy rain. Every electrical item I took with me survived and will be with me on my next journey, and so will Aquapac! Aquapac: What's been the happiest moment of your travelling career so far? Dave: Those moments of euphoria where I've reached the climax of a journey are hard to beat, but on the Mississippi a large flood had uprooted all kinds of vegetation and in the trunk of a tree floating down the river I found an American football. It was made by Wilson! Glorious moment. Aquapac: And the scariest moment? Dave: At the beginning of my source-to-sea expedition along the Murray River in 2009 I was caught in a freak snowstorm. I waited it out for two days until I realised the only way I was going to survive would be to walk 90km in metre-deep new snow. One wrong step could have been the end of me. Those were the hardest days of my life. Aquapac: And for all those times in between happy and scary, when you're just skating down a road or paddling down a river, how do you pass the hours? Do you enjoy the solitude? Aquapac: Who or what has inspired and encouraged you on your journeys? Dave: My parents, brother and friends are so supportive. It takes a big weight off my shoulders that the people I care about don't mind me disappearing for months on end, although maybe that says something about the quality of my company! I have some friends who do expeditions like me, constantly trailblazing and breaking down barriers, and they are great inspiration too - it's easy to break the mould when you're surrounded by people who make achievement part of their daily life. Aquapac: You're a busy guy. Do you ever give yourself a day off? What do you do to relax? Dave: Ha ha - I'll sleep when I'm dead! It's exhilarating being passionate about my work (a vast contrast to my day-job years ago) and if I finish a day with a shorter to-do list than when I started, then it's been a total failure! I enjoy working more than relaxing, but now and then I'll sit down with a beer in front of a football match on TV. Aquapac: And finally, tell us about your next trip. How long until you depart? And are you ready? Aquapac: We will. Good luck with your next trip, wherever it is.